We’re absolutely lovin’ cherry season this year, especially since it’s for such a short time, it feels extra special. Cherries are one of the best fruits to pack for snacks during the work day, on road trips, on camping trips, and even on plane rides, because they are strong enough to stand the heat and are less likely to get crushed than softer berries and nectarines or peaches. The rich and bright colour of cherries is caused by a type of flavanoids called anthocyanins. Anthocyanins have antioxidant properties and studies have found that cherries even have anti-cancer and anti-inflammatory properties. Cherries also naturally contain melatonin, so they are a good food to eat later in the day or for dessert in the evening as they are sleep supportive. Another reason why we recommend eating cherries instead of sweeter fruits, such as banana and tropical fruits, is because they are low glycemic and low in sugar. Many of our clients that are dealing with cancer choose to follow a diet that is low in sugar and avoid eating desserts, baked goods and refined carbohydrates. Studies have found that consuming sugar interferes with the function of the immune system, so if your body is compromised and dealing with a disease or even a cold, we recommend avoiding sugar and choosing very low-sugar fruits like cherries and berries (raspberries, blueberries and strawberries are all great options as well). You’ll still get to enjoy these delicious fruits while at the same time get the benefit of their antioxidant and vitamin content. 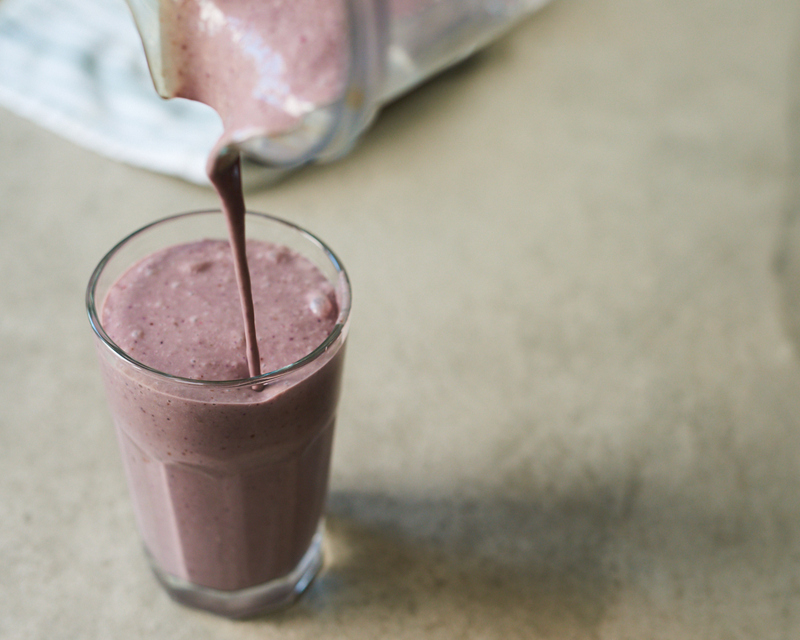 We’ve added some healthy whole-food fats into this smoothie, avocado and hempseeds. These will keep you feeling full for longer, as well as provide anti-inflammatory omega 3s. 1. Rinse off the cherries well and remove the pits. This part can be a little time intensive, but it’s worth it! There are two ways to do this- Option 1: We cut away as much of the cherry as we can from the pit. Option 2: We poke something into the center of the cherry (like a chopstick) to make a small whole and pull the pit out. 2. Then combine all the ingredients in the blender and blend until smooth and creamy.